Hideo Kojima is a mad genius who makes brilliant stealth games about hiding in cardboard boxes, and while the Metal Gear series has often dabbled in PC waters with a couple of shonky after-the-fact definitive editions (and, most recently, the scarcely related Metal Gear Rising: Revengeance), it’s now been confirmed that Metal Gear Solid V: The Phantom Pain and Metal Gear Solid V: Ground Zeroes are coming to Steam. If you don’t know what most of that last sentence means. Here’s a brief recap of why there are two Metal Gear Solid Vs, why they are interesting things in the first place and why you should be excited about playing them. We’ve also got 17 minutes of footage of The Phantom Pain from Gamescom. Lovely times. Kojima and his team are an unpredictable gaggle of strange and detail-obsessed designers, whose peculiar approach to creating videogames is honestly unlike any other studio currently in existence. Being the product of an eccentric Japanese studio pushes the series a few default clicks along the quirky scale to begin with, but the Metal Gear Solid games march further and further into design irreverence with each release. Utterly ridiculous but entirely po-faced plots about haunted arms and psychic soldiers sit alongside some legitimately revolutionary stealth mechanics, with enemies that you can manipulate, lure and taunt using a broad and varied armoury of gadgets and weapons. Metal Gear Solid has always been driven by a set of systems with which you can interact: artificial intelligences, the environment around you, objects that react as they should, a cast of voiced characters at the end of a radio who will comment on your current situation with thousands of lines of dialogue. It’s a stealth toybox where you can’t see the edges, a puzzle game that arms you with wildly different tools and lets you approach problems as you please. The sort of things Thief and Deus Ex were doing around the same time. There are stupidly small and series-defining details too: icecubes from a fallen ice-bucket that will melt if you watch them long enough, an elderly boss character who will die of old age if you save your game and come back a week later. All brilliant nonsense. In one game you must eat snakes to survive. In another you have adaptive camoflage that allows you to disguise yourself as a statue. Stomachs at Kojima Productions must lurch when the man says he’s had an idea. So Metal Gear Solid V: Ground Zeroes is a stealth game that was released for all of the Xboxes and PlayStations back in March, in which you play series main character Big Boss infiltrating a military base in Cuba. As well received as it was, many rightly considered it a demonstration of the potential of the upcoming Metal Gear Solid V: The Phantom Pain. Indeed, Kojima reckons Phantom Pain has a playable area at least two hundred times bigger than that of Ground Zeroes, and it expands hugely on almost all of its features. Ground Zeroes was a terribly short thing after all, designed for repeated playthroughs and experimental exploration. Phantom Pain on the other hand is a massive open-world stealth epic, with a day and night cycle as well as dynamic weather and all manner of shenanigan. It’s the proper Metal Gear Solid V, really, and both are now destined for PC. Lookie, here’s a 17 minute long demonstration of the thing being played. You can hide in a cardboard box. A hallmark of the series, Snake’s predilection for ensconcing himself in corrugated packaging in order to evade detection makes an expected return. This time he can summon a cardboard cube from his toolbox in the sky, a cargo plane that ferries objects to and from your secret sea base, out yonder on the ocean. You can strap a balloon to a goat. You send items back to your base by strapping a inflatable to them, whereupon your cargo plane will scoop up the item and deposit it back at your base. This works on soldiers, crates, a number of other things presumably, and goats. You can build your own sea base. You’ve got a customisable base, on to which you can attach new buildings and helicopter landing pads and stuff. 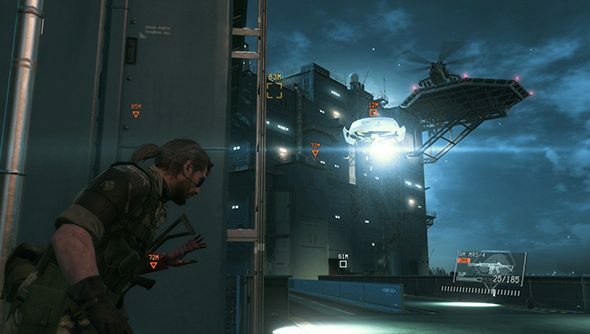 This base can be attacked by other real world players in Metal Gear Solid V: The Phantom Pain’s multiplayer mode. You can watch a horse do a poo. Your horse will plop in real time, thank goodness. You can smoke an e-cigar.It’s how you advance time. Guards will sleep at night, and do normal guardy things during the day, so remember to vape according to your infiltration preferences.